← Steel Cage Match: KMFDM vs …The Osmonds? And both singles were in stock and ready to ship! CD singles for £2.50 [$3.18] and vinyl for £4.99 [$6.34]! 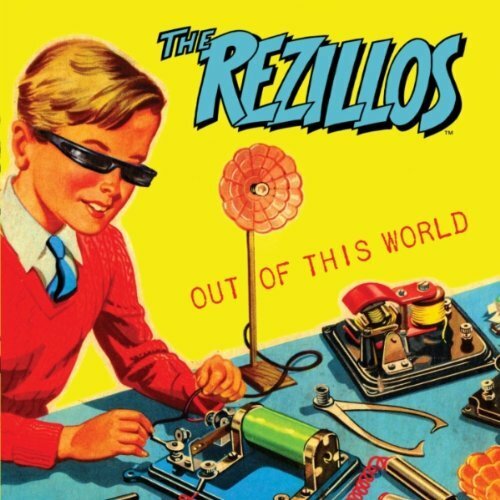 I went whole hog and since it’s The Rezillos, bought ALL variants: black vinyl “Out Of This World” 7″, clear and red live vinyl 7″ EPs, as well as both CD singles!!! Shipping from Scotland was… Are you sitting down? £2.50 [#3.18 again]!!! I ordered about 10 days ago and it took 9 days to get here and never has $27 been so well spent! Let’s examine the goods. Speaking of Bowie, the B-side was the same “Rosalyn” by The Pretty Things that Bowie sang on “Pinups.” This time Eugene bit the song with the fury of a pit bull and his squeals after the cold ending were hilarious. The Glass Mix of “Out Of This World” [CD and DL only] was mixed by Eugene Reynolds himself, and it eschews much of the instrumental gloss of the single mix to instead put the tougher sounding guitars and especially the vocals forward in the mix. The fadeout is more foreboding and mysterioso as well, with the feedback abetted with some roiling synths. 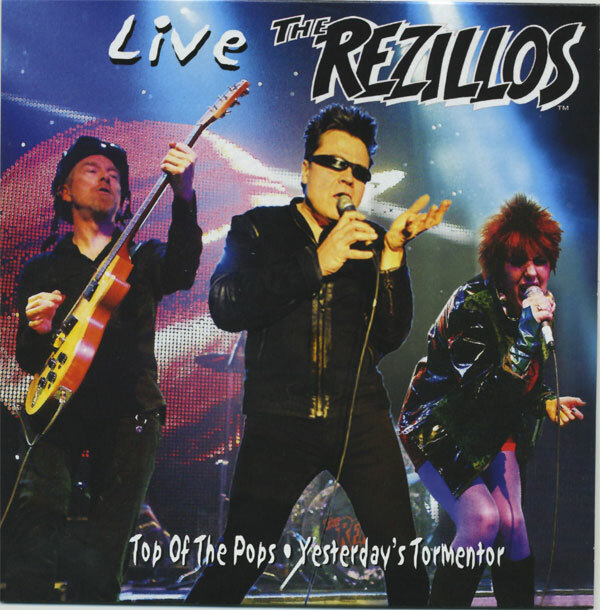 Rezliios classic “Top Of The Pops” still sounds like the vehement takedown of brown-nosing and payola that it always has been. There are some differences in this version, though. I can’t help but notice that singer Fay Fife has never sounded better even as I notice that the thick Glaswegian accent I am used to hearing the song through has faded away over the years. Like many vocalists of her vintage, she can out-sing her youthful incarnation nine ways to Sunday currently. This song is still three minutes of perfection. The rip-roaring “Bad Guy Reaction” has never sounded as furious as it does here. Even though the song’s running time has ballooned from 2:15 to 2:43, that’s largely down to the freakout ending that Eugene Reynolds built into the song here. The cold ending saw him bring the song to a halt followed by pregnant moments of silence, followed by his sputtering as he managed to spit out one “don’t even try to put me down” in what seemed like a split second. This take managed to make the classic LP version seem like weak sauce in comparison. The last song “Yesterday’s Tormentor” debuted here before taking its place on the new “Zero” album. The pace slacked off a bit here even as Ms. Fife tore into the bitter put-down of a song with vitriolic gusto. It never fails to make me marvel at how The Rezillos manage to marry furious punk energy with a love and respect for pop and in particular the rich vocal harmonies that they invest their songs with. My ardor for The Rezillos is such that I really do want to have everything under the sun in my Record Cell. Not only do I truly love this group, but they have an admirably finite amount of material out there; giving them a cachet of collectability that I can’t usually indulge in. To that end I also purchased the 7″ singles in all color variations from the band’s store. Kind of decadent, I know, except for one salient fact. The Rezillos, unlike most groups operating today, have not forgotten that they are making rock and roll music for the masses. All of these singles were priced as if the bottom had not dropped out of the music industry and everything but downloads were priced like rare jewels. This singles are not bespoke playtoys for the wealthy. To quote XTC, “This is POP!” Buy or Die! Store here. Go NOW! This entry was posted in Core Collection, Record Review, Scots Rock and tagged 2011, 2012, 7" singles, CD singles, Colored Vinyl, The Rezillos. Bookmark the permalink.